Blog By Tracy is celebrating one year this week and I couldn’t be more excited to share it with you. This is my very first giveaway. I hope you’ll take a moment to enter, you’d make my day! These are some of my favorite things from an Austin boutique who carries items from artisans right here in Texas and beyond. 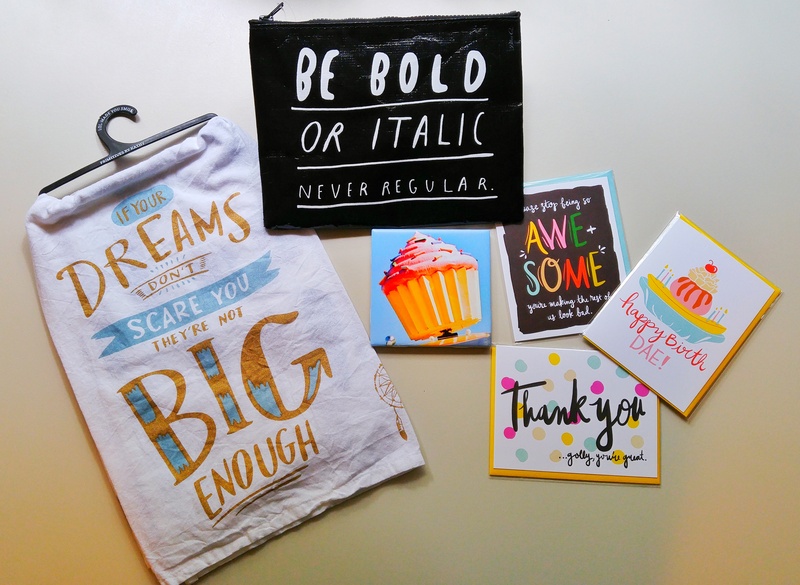 Here’s what’s in the birthday bag and it could be yours! Tip…once you visit my Facebook page, be sure to click the box “I Visited” and that’ll give you another couple of fun options. I love that zipper pouch! Congrats BBT! Entered! Entered! I love the tea towel! Congrats!! My blog is 8 years old and I only know that because I started it right after my son is born. Handy little way to remember. HA! Congrats. What an awesome giveaway. I really like the sentiment on the zipper pouch. I’ve never seen it before, but it is perfect. I’m commenting because I love a good blog giveaway! You are such a great blogger, I honestly thought you’d been around longer than a year Tracy. Thank you so much Kristin! What a compliment. I am a fan of yours. Thank you so much for signing up! Gonna announce the winner tomorrow.